Heat oven to 375°F. Spray 13x9-inch (3-quart) glass baking dish with cooking spray. In large bowl, beat eggs. Stir in pasta sauce, bread crumbs, onion, Italian seasoning, salt and beef until well blended. Press mixture in bottom of baking dish. Bake 40 to 50 minutes or until meat thermometer inserted in center of loaf reads 160°F. Meanwhile, make potatoes as directed on pouch, using milk, water and butter. 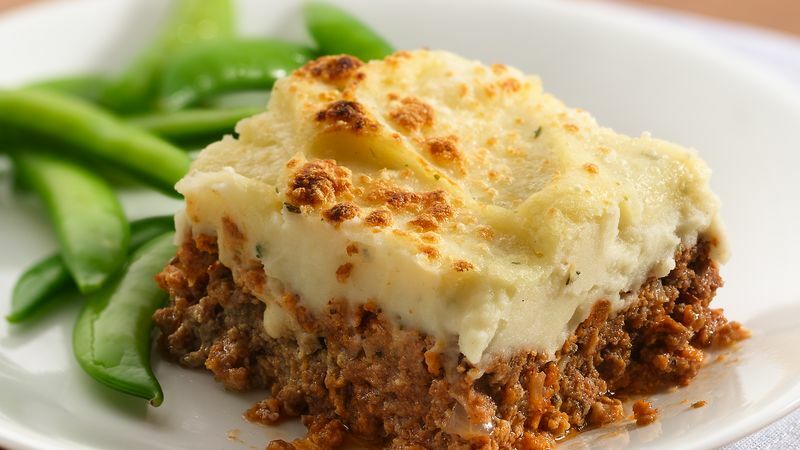 Spread mashed potatoes over meatloaf; sprinkle with cheese. Bake 10 to 15 minutes longer or until top begins to brown. Let stand 5 minutes before cutting. One teaspoon each of dried basil and oregano leaves can be substituted for the Italian seasoning. For extra flavor and spiciness, use bulk Italian pork sausage for part of the ground beef and add 1 teaspoon crushed red pepper flakes to the pasta sauce.